As a young Christian I had the pleasure of knowing Colonel Cook retired. He and his wife had also been Missionaries, they were inspiring to listen to, supportive and encouraging in every way to a young woman who although belonging to the big parish church on the top of the hill, shared with them in the mid-week prayer meeting at the small New Testament church at the bottom. I learnt many things from Colonel Cook, he kept bees and one memorable day, treated my curiosity to a close look at the queen in the hive! I was, so he said, a true Englishwoman and could be relied on to be calm in all situations! I don’t know about that. I do know that in their long lives the Cooks had many adventures in The Lord where calm and cool courage was called for. A look in the Colonel’s bible was revealing, his must have been amongst the most marked up bibles in the world. He always got ones with wide margins, read and wrote down insights received. When there was no room to write more, he bought a new bible and started over again. Somewhere, I hope there is a book shelf filled with his lifetime’s study notes. Perhaps you may have a different view? This Thursday, our Lectionary Readings and Prayers are for Ascension Day, as far back as Church Records go, this day has been kept to mark the final departure and return of The Lord Jesus to heaven. For 40 days he had appeared after the resurrection, teaching, strengthening and preparing his disciples for their work of witnessing and carrying forward the work of the Kingdom of God. I have noticed that we always seem to get rain either on Ascension Day itself or a day or two either side, maybe that’s because like a true Englishwoman I notice the weather. The rain of Ascension Day prepares the soil for the sowing of seed at Pentecost, my gardening uncle would absolutely forbid me to plant out Runner Beans until Whitsun (another name for Pentecost), it was reckoned that once Whitsun arrived the frosts would finally be done, the soil is friable. Things sown grow then. The teaching of those 40 days between the Easter Day and Ascension Day, prayed over, pondered over in the next 10 days was sown in the Spirit’s Power when the Day of Pentecost had fully come. My nephew used to call Ascension Day “Going up Day” while Pentecost was “Coming Down Day” Jesus was taken up into heaven to receive a crown and gifts to shower down. (Luke 24 v50-52.Eph. 4 v8). The painting is the work of John Singleton Copley ( 1775) an American born artist. Thanks for sharing this painting by Copley, I had never seen it before, or have heard of this artist. I noticed that it always rains when it’s time for the annual parade on Guam, but that can be due to its being the rainy season (dunno when that actually is). Sometimes days seem more sorrowful when it rains, no? 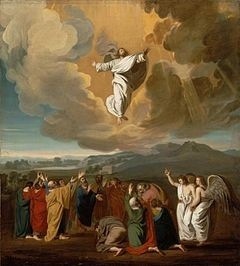 This is great that you had written a post on Jesus’ Ascension. I used to wonder before, when it wasn’t mentioned that much in messages. Thanks for your comment and for sharing your own thru-the-Bible reading experiences. p.s. What a Runner Beans? Runner Beans are known by lots of local names in the U.K. They are purple/red beans which grow in long green pods on vines which are trained in old fashioned gardens like mine up rows of long sticks 6 ft or so, sometimes to save space the sticks are formed into a ‘wig-wam’. These beans don’t like frost. But need lots of water, I suppose by the time Whitsuntide arrives the ground is wet enough to give them a good start! Thank you for reading and expressing your interest. Blessings. I also had never seen the picture by Copley before. Thanks for sharing it.